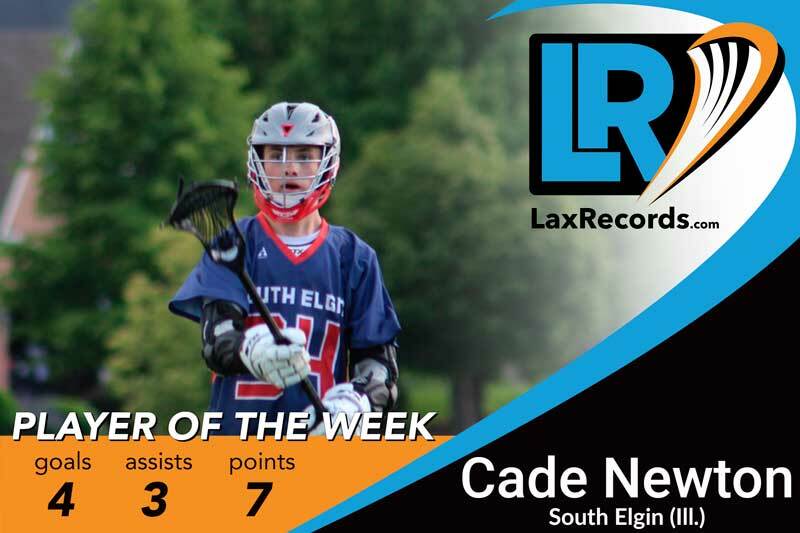 Gavin Tygh broke the national record for most career faceoff wins to earn LaxRecords.com Player of the Week. Tygh became the nation’s leader for the most career faceoff wins with a 15-for-21 performance against Lawrenceville (N.J.) on Saturday. The Virginia commit has 1,148 career wins to break the record previously held by TD Ierlan*. 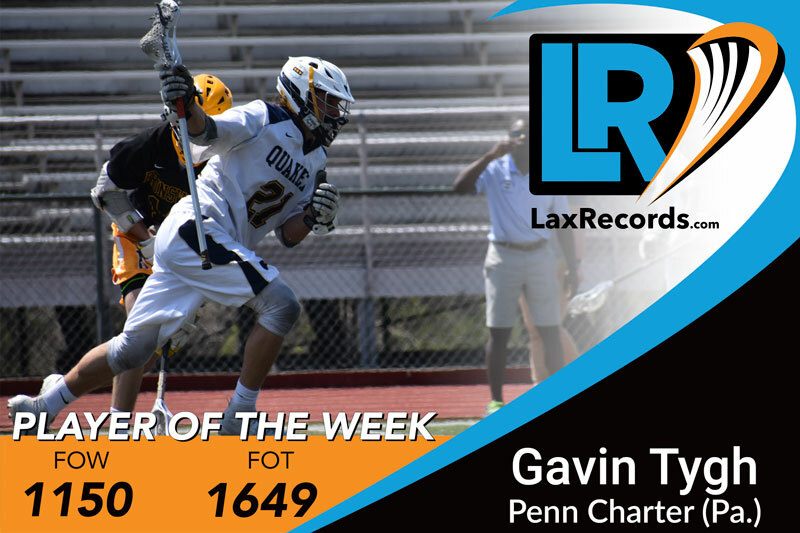 Tygh started the week winning 17 of 19 face-offs to help Penn Charter control the ball and defeat St. Augustine Prep (N.J.) 8-7, which put him close to the record. The senior is winning 71 percent of his opportunities this season and has eight games in which he has won at least 11 face-offs. In each of the last two seasons, Tygh has won more than 300 faceoffs. He has 136 this season. Editor’s Note: Ierlan’s college bio lists him with 1,135 career wins, but Victor head coach Jim Andre has him with 1,119. For the purposes of this article, we are using the college totals to ensure the record is broken. Birtwistle scored three goals and two assists in a 14-11 win over Strath Haven (Pa.) on Tuesday. He added a goal and an assist in a one-goal loss to Springfield-Delco (Pa.). 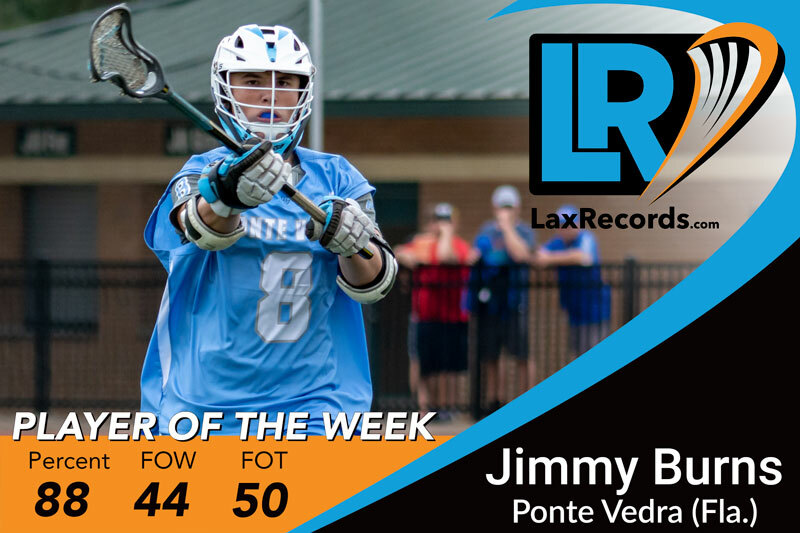 Bua joined the 300 Club with a five goals, four assist performance against Everett (Mass.) 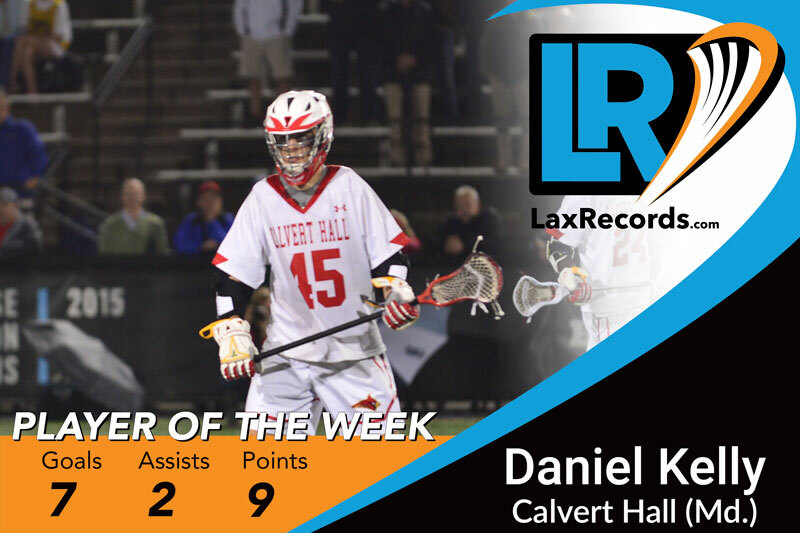 The senior had quite the week, with a 13-point game against Salem (Mass.) on April 8. Bua is coming off a 108-point season and now has 30 for this year. The senior made 16 saves against nationally-ranked St. Anthony’s to help his Flyers to a 13-7 victory last week. Chaminade is the defending CHSAA Class AA champion and improved to 4-0. They handed St. Anthony’s their first loss at 5-1. Keller dished out four assists and three goals in the Ramblers 10-6 win over St. Viator (Ill.). His third goals put Loyola up 9-5 in the fourth quarter. Maher had his hands in 11 of the Falcons 16 goals Friday night in a win over county rival Broadneck (Md.). Maher scored eight goals and had three assists in the 16-7 win that gave Broadneck its first loss of the season. The midfielder totaled 10 points on six goals and four assists in a 15-7 win over Baylor (Ga.) to push him past 300 career points. 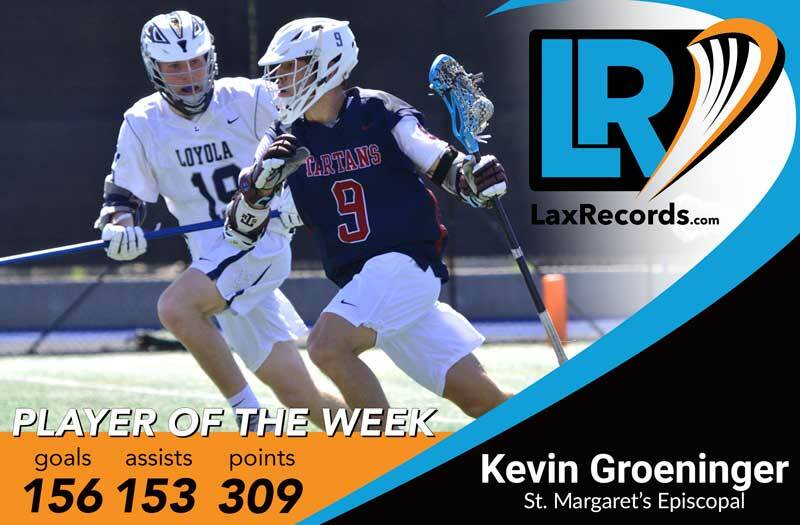 The Georgetown commit now has 302 points on 194 goals and 108 assists. Pietramala scored three goals in an 11-10 win over McDonogh (Md.) 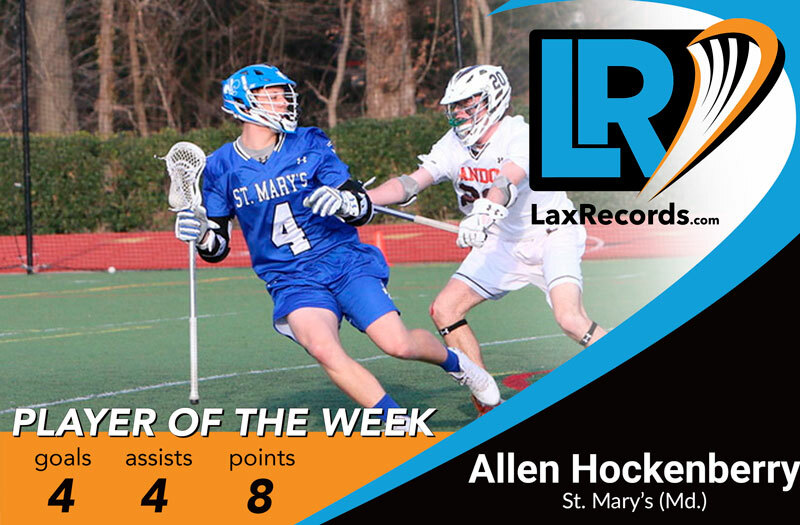 to start the week, then totaled nine points in a victory over Loyola-Blakefield to cap it. The freshman scored seven goals and notched two assists in the win over Loyola-Blakefield to help the Lakers improve to 3-1 in the MIAA A Conference. Schwartz became North Carolina’s all-time faceoff wins leader with a 10-for-12 game against Garner Magnet (N.C.) on April 12. The Middle Creek (N.C.) senior became the known leader in North Carolina history with 836 career wins. He breaks Peyton Smith’s record of 827. With 12 points in a 20-4 wi over Plano (Texas), Schmitt broke the known-Texas record for most points in a career. Schmitt has 350 career points (229 goals, 121 assists) to break the previous record held by Max Skibber from Episcopal Houston (Texas) since 2012. 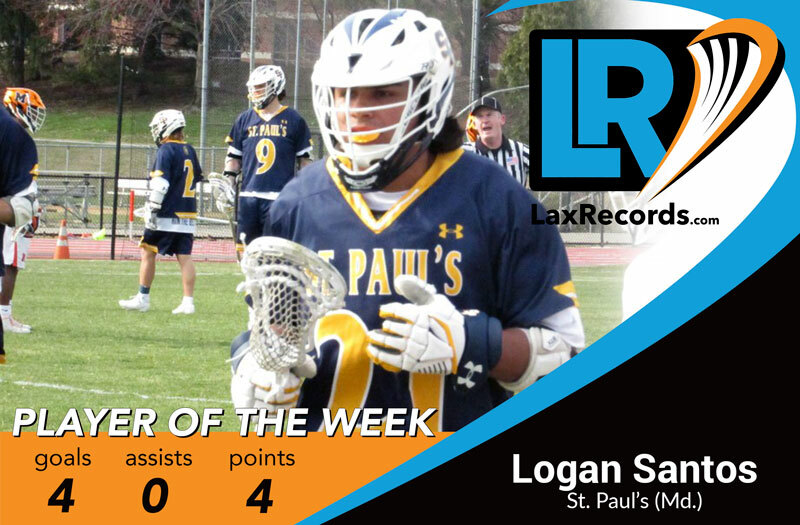 Sharp led the Sea Kings with seven points in a 16-4 win over Foothill-Santa Ana (Calif.). 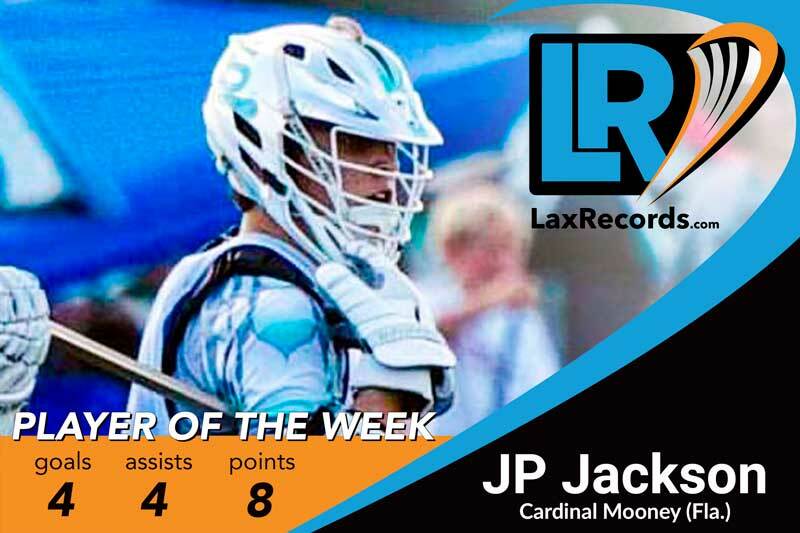 Whittall surpassed 300 career points with an impressive 14-point game against Murrieta Valley (Calif.) on April 8. The senior scored nine goals and five assists in the win, which also marked his return after missing three games due to injury.